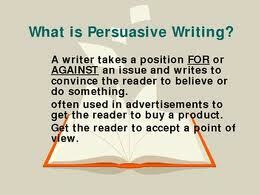 The language of persuasion is usually found in advertising, speeches, magazines, newspapers. When using persuasive writing remember who your audience are. Ensure there is clarity in what you are writing, and that it follows a logical sequence. The language of persuasion is different to the language of argument because persuasion appeals to others at an emotional level. Arugument is used in debate and presents information and evidence to back up a position been taken.